Violet is sure Lacey is innocent, and to keep her friend out of prison, Violet asks for guidance from her magical bookshop. The shop’s ethereal essence points her to Louisa May Alcott’s Little Women, but what have the four March sisters to do with the four Perkins sisters? If she can’t figure it out, Violet, herself, may turn as cold as ice. Violet, Grandma Daisy, Emerson the tuxedo cat, and resident crow Faulkner are back on the case. I picked this up for review on a whim and I have to say I was so delighted that I did. 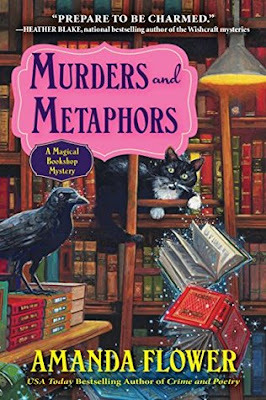 How could I resist a cozy mystery with a quirky, magical bookshop that helps solve the mysteries? It was definitely a different take on a paranormal cozy, which I found refreshing. Here’s what’s going on. When hometown girl and sommelier Belinda Perkins is murdered at her book signing, Violet and Grandma Daisy are determined to prove that Belinda’s sister and Violet’s best friend, Lacey, is innocent. Violet has a feeling she knows who the murderer is but when her bookshop’s essence keeps dropping clues in the lap in the form of Little Women by Louisa May Alcott, Violet starts wondering if there’s something more going on with the Perkins sisters. Will Violet and Grandma Daisy be able to figure out who the murderer is now that Violet seems to be a target? I wasn’t sure what to expect with this one and I did struggle a bit at the start with the magical tree bit as I was worried this one would feel a bit childish but I finally found my groove with this book and I’m so glad I did. I really ended up enjoying the magic of the shop and the way the shop’s essence helps solve the crime. Violet and Grandma Daisy were fun characters to get to know. Both and a bit quirky and completely determined to do what they set out to do and that often leads them into trouble. Violet having recently returned, they’re both still sorting out their relationship and Violet’s trying to come to terms with what it means to be the caretaker of the magical tree. She’s struggling a bit as she figured out how to balance that responsibility with her personal life. The mystery was brilliant and I liked how the book paralleled things in Little Women with things going on with Belinda’s mystery. I had an inkling who the murderer was and I was right but I still enjoyed watching how it unfolded. So, there’s a bit of a love triangle that seems to be happening between Violet, Nathan Morton—the mayor and son of a wealthy family, and David Rainwater—the local police chief. As of now, Violet seems to be giving David a chance but there’s still something—not so much a romance but a lingering connection—to Nathan. There’s a major chunk of Violet’s story I missed having not read the first two books and, while I wished I had her entire backstory, I had no trouble following along with this one. Overall, I really enjoyed this one and look forward reading the previous books in the series.